Stone women called by the scientists as stone statues are figures of people who lived about three thousand years ago. The foundations of stone statues are deep below ground, nevertheless. 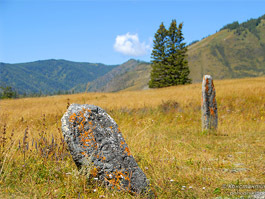 According to Altai legends, stone statues are animated and they can even walk. 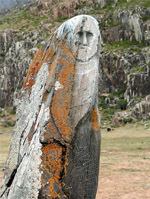 Stone statues are usually situated not far from ancient Turkic commemorative fences. However, these are not monuments in the modern meaning, these are commemorative statues. It is considered that they headed festival tables on funeral feasts in honor of those whom they depicted.